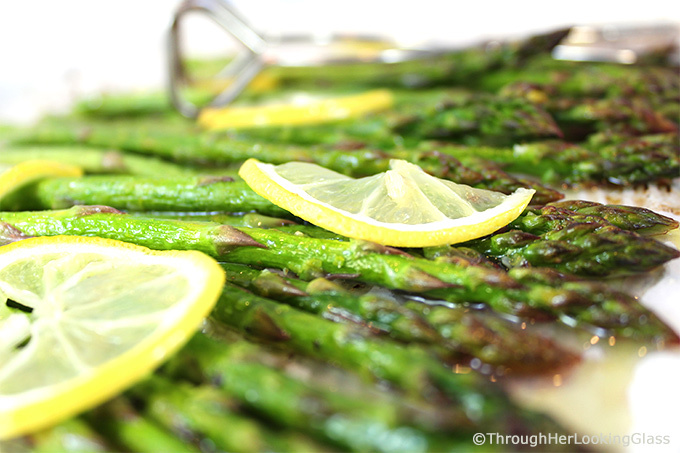 Lemony Garlic Roasted Asparagus: You’ll love this zippy new twist on asparagus. 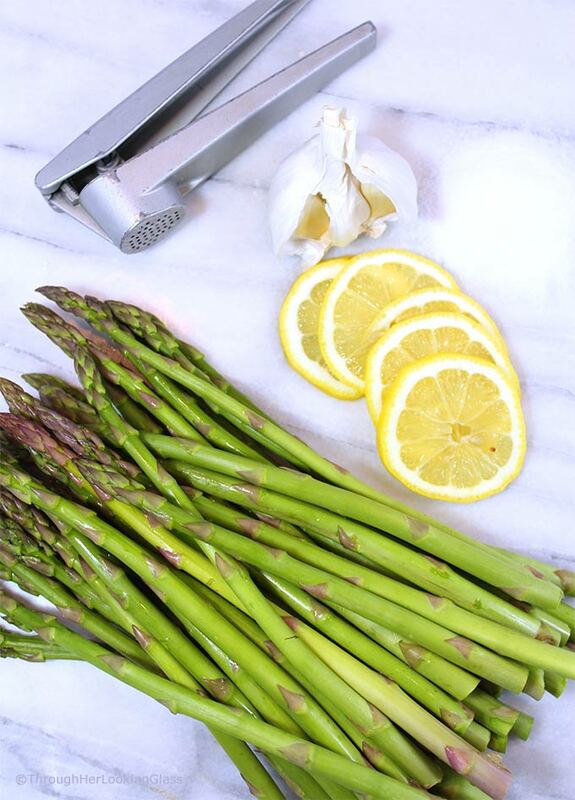 Fresh asparagus is oven-roasted ’til tender, basted with olive oil, garlic, fresh lemons slices and lemon zest. 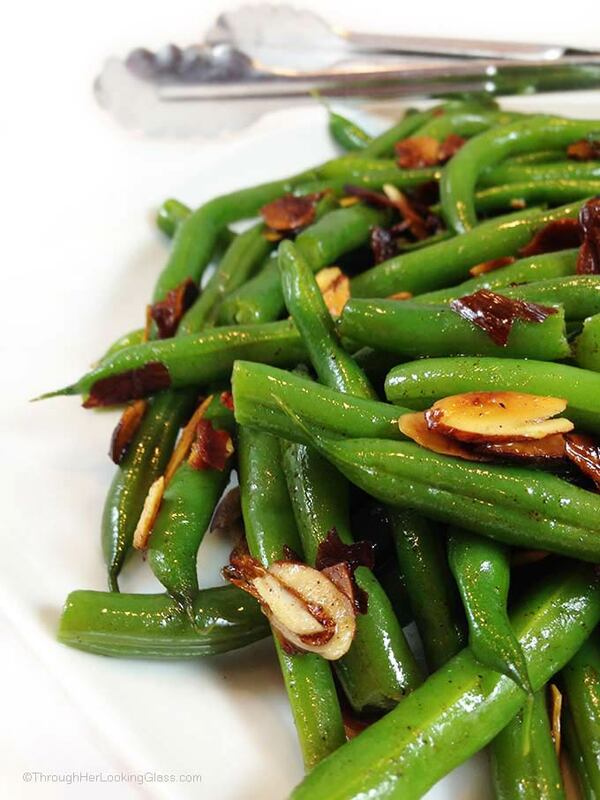 This gourmet side dish comes together quickly with minimal effort. Perfection for Easter or anytime! Mother Nature has been such a tease this winter. Yesterday winter was back in full force and the thermometer registered 21° first thing, but this coming weekend looks like it will be in the sixties. Last week we had a few blissfully warm days with sunshine and so we all got our hopes up of course. As if spring had finally arrived. Ha ha, the joke’s on us. If you live in New England, you know the saga. And spring doesn’t have a thing to do with a date on the calendar around here. There is no coercing. She comes when she’s good and ready and not a milli-second earlier. So when I think spring, I think Easter. And when I think Easter, I naturally think Easter ham and that leads to the asparagus that is always serve alongside it. True confession: I ate more than half this pan of roasted asparagus all by myself. I wasn’t necessarily opposed to sharing, it’s just that it was lunch time and no one else was home. The best months to buy asparagus are March through May. Choose firm tips with a slightly purplish tint. Trim the tough ends off, up to an inch or two if needed. Some people peel the end of each asparagus spear with a vegetable peeler to make it more tender, but that takes some extra prep time. Storage tip: trim the ends, then secure the bunch together with a rubber band. Store upright in a mason jar or tupperware container in the refrigerator with an inch or so of water at the bottom. This can keep it fresh for several days or even up to a week if you’re lucky. This Lemony Garlic Roasted Asparagus was so easy to make. Wash and trim the asparagus, then lay it out on a parchment lined baking sheet. Separately, in a small bowl, whisk together the fresh lemon juice and zest, extra virgin olive oil and fresh minced garlic. Baste the asparagus, using all the marinade. Generously sprinkle the asparagus with sea salt and freshly ground pepper. Garnish with fresh lemon slices tucked through out. Roast at 425° in the upper half of your oven for about ten minutes. Transfer to a warmed serving dish and serve hot alongside a main dish. Other asparagus dishes you may also like: Asparagus Stuffed Chicken Breasts, Easy Cheesy Asparagus, and Asparagus Orange Spinach Salad with Basil Lemon Vinaigrette. Place trimmed and washed asparagus on a parchment lined baking sheet. Separately, in a small bowl, whisk together olive oil, juice from one lemon, lemon zest and minced garlic. 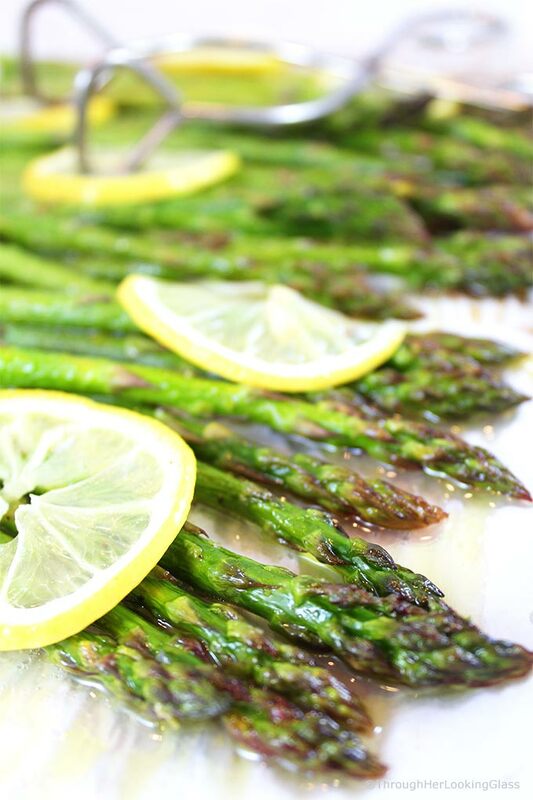 Brush the olive oil and lemon mixture on the asparagus to coat, turning the spears so they are entirely covered. Sprinkle liberally with sea salt and freshly ground pepper. Arrange the lemon rounds among the asparagus. Bake on a baking rack in the upper half of a 425° oven for 8-10 minutes, or until asparagus is easily pierced by a sharp knife and just beginning to turn golden. Transfer to a warmed serving platter. Pour extra pan juices and marinade on top, and serve immediately while hot. If you don't have fresh lemons on hand, use 2 tablespoons bottled lemon juice instead. I can't wait until we get some decent spring asparagus in the markets! I'll be trying your fabulous recipe!!! You had me at lemon and garlic! This winter has been the *weirdest*, weather-wise! This looks like a side dish that would be delicious on one of the warm OR cold days we've been having. YUM! Yum! I make this often and serve creamy, risotto over it to turn it into a whole meal. Amie - that sounds WONDERFUL. What a great idea - I will definitely try this with creamy risotto. Yum! What an easy recipe really!!! Since you have added garlic to this recipe I am sure it is gonna be a tasty recipe. Haha - Allie, there are so many times that "sharing" has eluded me too - even though I myself don't oppose it! Though I have a confession - that's not quite the truth - I think sharing is overrated sometimes - and I would have easily eaten half of these heavenly scented and delicious roasted asparagus too! What a delightful way to celebrate Spring - even though it seems to elude y'all currently. I hope Jonathan got back to Uni safely (if his spring break ended - if it hasn't, I know you will be enjoying yalls time together for sure! Happy Monday sweet friend! Hope you have a wonderful week and things warm up soon! Je crois que j’aurais pu manger la moitié de tes asperges aussi! Ils pareils tellement bon! Ici aussi, c'est la saison des asperges et j'adore! Mmmm, loving the idea of making this dish sooner rather than later. Instead of trimming the asparagus with a knife, my Mom used to break off the ends with her hands. She'd just put both hands somewhere near the middle to end of the stems, one at a time, and snap off the ends; wherever the ends "should" break off, they do break off. Practice makes perfect -- it's fool proof, really -- and no knife is needed. Thanks for that good prolonging-life storage tip! 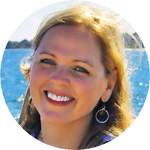 Follow Through Her Looking Glass 's board www.ThroughHerLookingGlass.com on Pinterest.